Unlike the southern section of the Northeast Corridor, which is a relatively straight alignment of four, Amtrak-owned tracks traveling through every major city in between New York and Washington, the northern section of the Northeast Corridor is not well-suited for modest upgrades to implement faster, more efficient intercity service. From New Rochelle to Boston, Amtrak actually owns only a small portion of track through eastern Connecticut and Rhode Island, with the remaining segments owned by the MTA, Connecticut DOT, and MBTA. In addition, with the exception of the four-track, MTA Metro-North New Haven Line, the remainder of the northern section of the Northeast Corridor is just two tracks wide. Further, widening the existing alignment from New Haven to Boston would be disproportionately expensive to achieve through service for express trains wishing to avoid the dozens of intermediate stations in Connecticut, Rhode Island, and Massachusetts. Fortunately, there are far fewer trains occupying the Northeast Corridor between New York and Boston than between New York and Washington. For example, of the 47 daily trains traveling from Philadelphia to New York, only 18 continue on to Boston. 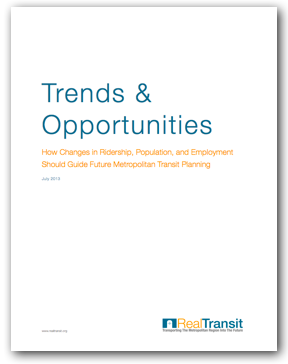 This discrepancy, however, begs the question of whether tens of billions of dollars should be spent upgrading a segment of track that attracts significantly lower ridership when there are a number of underserved markets within the broader region that would benefit from increased access to intercity passenger rail. The answer is that intercity rail investments should add value to the regional system as a whole, instead of maintaining a century-old alignment merely because it already exists. Aside from the question of demand, upgrading the existing northern section of the Northeast Corridor would cost significantly more than creating a new alignment due to the tight curves traveling through dense areas that limit average speeds more than on the New York to Washington segment. Amtrak estimates that it’s high-speed upgrades from New York to Boston would cost $58 billion and would not be completed until 2040. 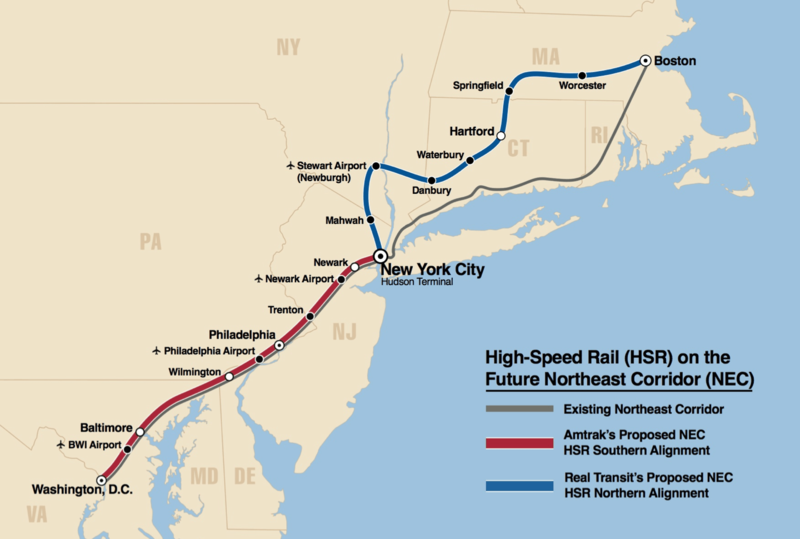 It should not cost that much and take so long to bring modern, high-speed service to the northern section of the Northeast Corridor. Thus, moving forward, the most cost-effective way to improve the New York to Boston route is by constructing a completely independent alignment. 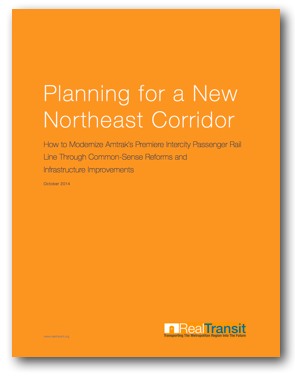 In choosing a new right-of-way for the northern section of the Northeast Corridor, it is important that the new alignment not only reaches underserved markets, but also prepares for additional expansion in the future and creates new demand for each completed segment track. 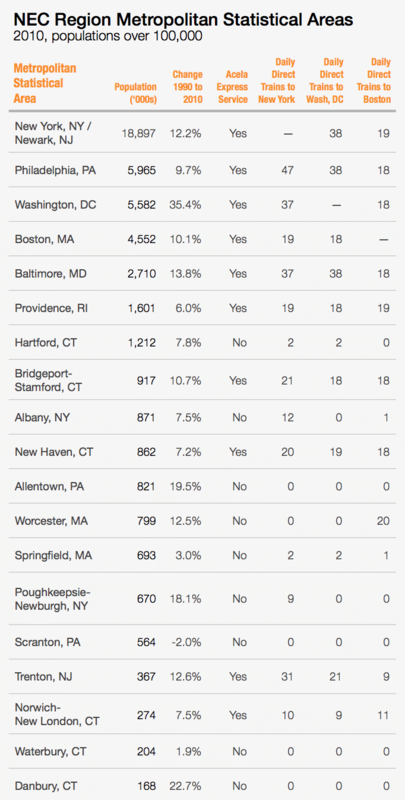 Among the 19 metropolitan statistical areas (“MSAs”) in the Northeast Corridor region with over 100,000 residents, nine MSAs with a combined population of over six million residents do not have any direct access to express intercity rail service. Cities like Hartford and Springfield, which combine for almost two million residents and are only 100 miles from Boston and New York, are still relatively isolated in terms of the availability of intercity rail service. Since 1990, other MSAs like Poughkeepsie-Newburgh and Worcester have grown much faster than MSAs such as Providence and New Haven. Finally, the 100-mile segment of track that runs through eastern Connecticut and Rhode Island serves a relatively isolated population of just 300,000 residents. In order to open up access to cities such as Hartford and Springfield, the Northeast Corridor can travel along a number of different routes. The existing path from New York to New Haven is riddled with tight curves, dense development, and multiple competing commuter railroads. 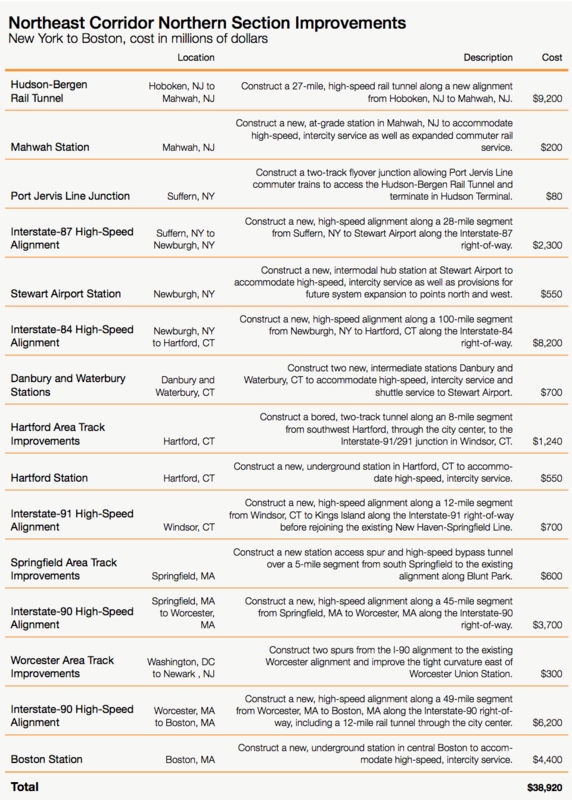 Thus, simply upgrading this alignment and constructing a high-speed connection from New Haven to Hartford may be feasible, but would ultimately cost far more than an alternative route and would benefit populations that already have access to high-speed, intercity rail service. Proposed alternative routes that travel through Penn Station and deep into Long Island before curving up to New Haven en route to Hartford would also incur tremendous costs to benefit resident populations that already have a diverse selection of transit options. Further, a Long Island alignment would require the seizure of thousands of private properties through one of the densest residential areas in the nation and would also require the construction of a 70-mile tunnel from New York to Connecticut. Overall, the benefits of these proposed alignments are far outweighed by their costs, and they do little to add significant value to the region’s transportation infrastructure as a whole. To maximize the benefits of a new northern section of the Northeast Corridor, Real Transit proposes constructing a new alignment through Stewart International Airport in Newburgh, NY. 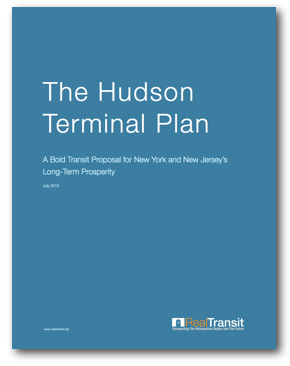 Getting to Stewart Airport from Hoboken Station would require the construction of a 27-mile, high-speed rail tunnel to Mahwah, NJ, where the tracks would then follow the general right-of-way of Interstate-87. At top speeds of 220 miles-per-hour, an express train could travel from Hudson Terminal to Stewart Airport in under 25 minutes. Even at top speeds of just 120 miles-per-hour, an express train could travel from Hudson Terminal to Stewart Airport in under 40 minutes. Continuing from Stewart Airport to Hartford, the proposed alignment would follow Interstate-84 through intermediate stations in Danbury and Waterbury. At roughly the halfway point between New York and Boston, express trains traveling along the proposed alignment from Hudson Terminal to Hartford at top speeds of 220 miles-per-hour would be able to make the trip in just 65 minutes. There are a number of key benefits that the Stewart Airport alignment offers over competing alignments. First, creating a high-speed rail line from Manhattan to Stewart Airport would, on its own, result in the designation of Stewart Airport as the de facto fourth major airport of New York City. As the current owner of Stewart Airport as well as the metropolitan region’s three other major airports, the Port Authority of New York and New Jersey has a vested interest in expanding its passenger base in Stewart Airport and relieving the congestion within its other three major airports. In addition, the Port Authority already owns the undeveloped land adjacent to the Stewart Airport site, which will significantly contain costs for future expansion of the airport’s terminal structures and runways. Upon its opening, a Stewart Airport high-speed rail station would realize significant, instantaneous demand, thus generating additional revenues that rail-only alignments would not be able to offer. For comparison, the Port Authority’s JFK AirTrain, which travels from Jamaica Station and Howard Beach to JFK Airport, has a daily ridership of over 11,000 passengers even without direct service to Manhattan. The Stewart Airport station would also help to serve markets that have historically lacked the kinds of transit diversity offered by similarly situated cities in relation to Manhattan. For instance, the Newburgh-Poughkeepsie metropolitan area is roughly equidistant to Manhattan as the Trenton metropolitan area. Yet, there are over 80 daily, direct Amtrak and NJ Transit trains from Trenton to New York compared to just 40 trains from the Newburgh-Poughkeepsie metropolitan area to New York. This discrepancy exists despite Trenton having less than half the resident population as the Newburgh- Poughkeepsie metropolitan area. 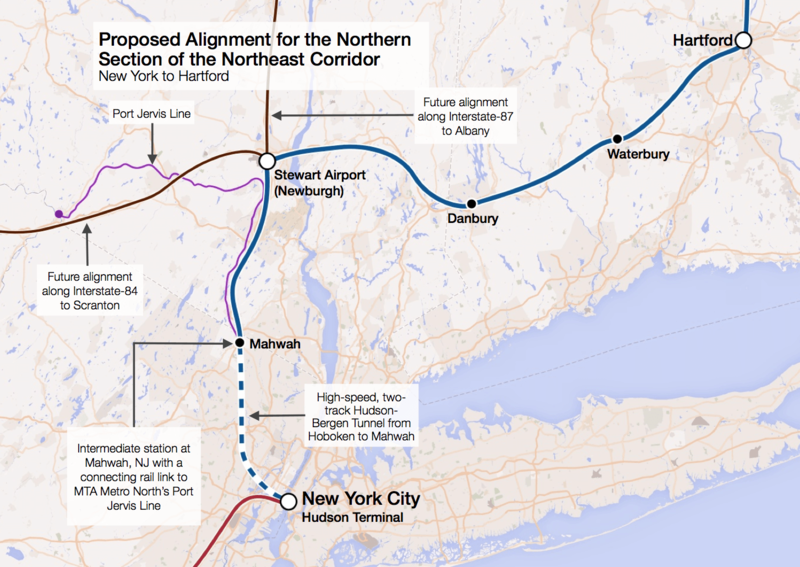 In addition, a Stewart Airport alignment would allow for commuters on the MTA Metro- North’s Port Jervis Line to connect to Manhattan at significantly reduced travel times. In terms of regional location, the Stewart Airport alignment also allows for future expansion to underserved markets in Pennsylvania and northern New York, which would in turn broaden Stewart Airport’s passenger-base and increase ridership. And unlike other proposed alignments that require at-grade construction through dense areas of New York City, Westchester, Long Island, and Connecticut, a Stewart Airport alignment would be able to take advantage of multiple, existing right-of-ways along Interstate-87 and Interstate-84 in order to reduce the need for eminent domain seizures. 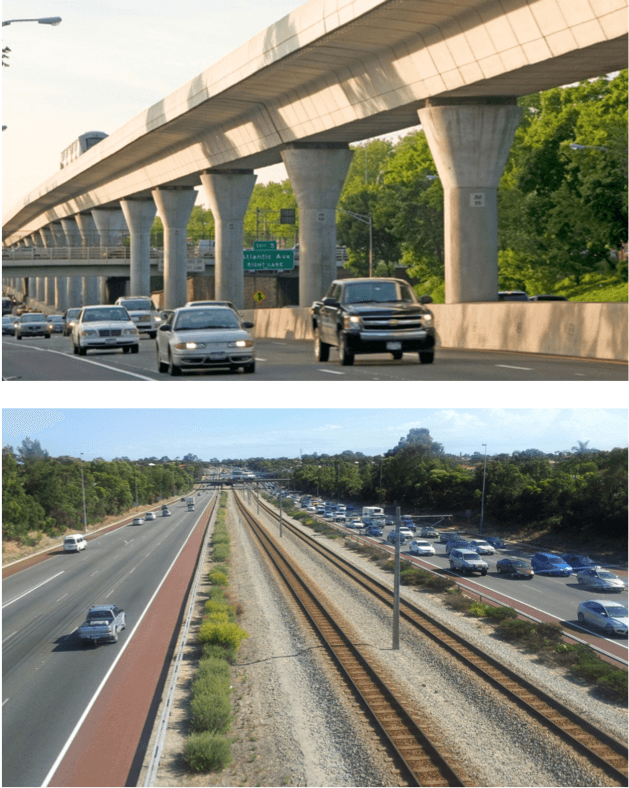 Construction of elevated or at-grade trackage along these highways would drive costs down compared to the extensive tunnels needed to complete a central Long Island or Connecticut waterfront alignment. Overall, the Stewart Airport alignment comprehensively addresses a number of long- standing, regional transportation challenges, such as metropolitan airport overcrowding and delays, underserved regional transit markets, and the high cost of constructing new alignments through saturated urban and suburban areas. From Hartford, tracks would follow a new alignment along Interstate-91 towards Springfield. At the area around King’s Island, tracks would diverge from the highway and join an upgraded, 10-mile portion of the existing, Amtrak-owned New Haven-Springfield right-of-way. 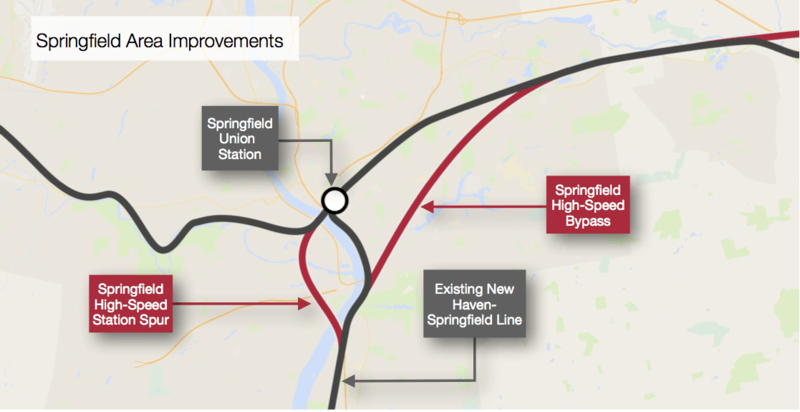 At the southern border of Springfield, the tracks would diverge with one spur looping into the existing Springfield Union Station and another spur bypassing the city towards Interstate-90. A new alignment from Springfield to Worcester would follow Interstate-90 for approximately 40 miles before diverging just east of Auburn, MA, with one spur traveling through Worcester and another bypassing the city center heading towards Boston. The Worcester spur would join existing tracks traveling northeast into the city center and through the existing Worcester Union Station. Exiting the station, tracks would continue along a new, one-mile tunnel to bypass existing curves before rejoining the existing right-of-way at Grafton Hill. The tracks would once again converge at East Milbury, MA to rejoin a 27-mile Interstate-90 alignment to Boston. At the intersection of Interstate-90 and Interstate-95, the alignment would sink to a new 12-mile tunnel before terminating at a new, underground Boston Station. Provisions would be made to allow for a future link to existing routes terminating at Boston’s North Station.